Rolling multiple sub-genres of rock and metal into one cohesive and captivating recording is no easy feat but Tauranga’s MACHETE JUSTICE have achieved it, and on their debut album no less! The first thing that springs to mind as I hear the opening guitar harmonics and militant drumming in ‘Eyes On The Crown’ is that this could easily be the intro to the next MACHINE HEAD album. But thrash is just one of the genres explored on ‘Reversion’ and by the time this recording is done MACHETE JUSTICE will have covered everything from southern sludge and groove to blast beats and even an acoustic waiata. Tracks like ‘Devil In My Veins (Again)’ and ‘The Ballad Of Bubba J. White’ are right in the vein of DOWN and CORROSION OF CONFORMITY and prove vocalist Tarquin Keys’ ability to sing rock vocals as well as the more coarse ones. There are other styles of metal thrown into the mix as well and I found some irony in the fact that ‘Pity For The Haunted’ actually sounds like something written by Swedish thrashers THE HAUNTED themselves! CHIMAIRA instantly springs to mind when I hear the metalcore stylings of ‘Reckless’… see what I mean about a mixture of styles! ‘South Of The Border’ has to be one of the stand out tracks on this album. It’s heavy, it’s melodic and best of all, it has technical and uber-catchy guitar shreds. Think of leads on a similar buzz to IN DREAD RESPONSE’s ‘Cannons At Dawn’. 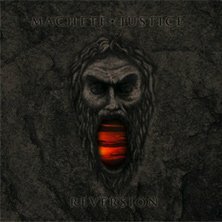 An impressive debut recording in both songwriting and production and one which after the gentle comedown of ‘Waiata Ua (Rain Song)’ leaves me wanting to hear what musical direction(s) MACHETE JUSTICE will be taking on their next release.